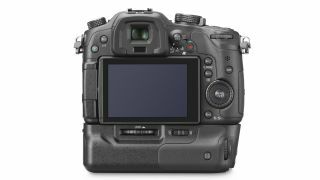 Although the Panasonic GH3 - announced at Photokina 2012 in Germany - doesn't currently offer focus peaking or 'zebras', these features could be added with a firmware upgrade, according to Panasonic's product planning manager, Mr Uematsu. Speaking exclusively to TechRadar at Photokina 2012, Uematsu acknowledged that there have been many requests for focus peaking on the Panasonic GH3 to indicate the sharpest areas in a scene when a video is being recorded. He went on to say that this, and 'zebras' (a type of exposure warning) could be added with a firmware upgrade. However, he went on to say that adding features with a firmware upgrade takes a level of resources that isn't currently available, and the company would have to assess the demand. The Panasonic GH3 is an upgrade to Panasonic's GH2, which won wide acclaim for the quality of the video footage that it records. Panasonic has enhanced the video shooting capability of the GH3, enabling broadcast-quality footage to be recorded, and upgrading the audio input port to a 3.5mm socket. There's also an audio output socket so that headphones can be connected to monitor sound and in-camera sound level adjustment.